A 2015 study by Harvard University found access to transportation is the single biggest factor in the odds of escaping poverty and avoiding homelessness. latimes.com Temperatures remained around 100 degrees as the fire fight moved into the night. Powerful evening winds were pushing the blaze, which authorities said began as a structure fire, in different directions. The San Diego Union-Tribune: "Asked why the cost of building new highways and roads was spiking, Caltrans District 11 acting Director Cory Bims blamed the fluctuating cost of raw materials. “It can be very volatile,” he said. “Major construction items for projects, steel and concrete and asphalt, there’s lot of things that influences those costs. 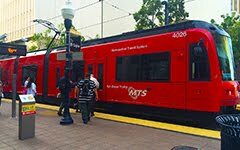 It can come back down again as quickly as it went up.”"
Long Beach Transit's Free Passport Route Runs on Electric Buses! Straight Outta Suburbia / Saliendo de las Afueras : "The electric bus revolution continues! Long Beach Transit has rolled out an electric bus fleet on its Passport route. The Passport is a bus line which runs in a loop centered on Downtown Long Beach. It's a good way to get from Downtown to the Queen Mary, the Aquarium and Shoreline Village. Unlike a real passport, you don't have to pay to get on board: it's free to ride. To top it all off, the frequency of service is pretty good. It's only 10 minutes between buses during daytime peak periods, even on the weekends, according to the timetable. #Publictransit is a public investment. Fares are for rationing, not revenue. desertdispatch : "It is in no way unique, but the authority is significantly reliant on federal and state funding to bankroll operations, beginning each fiscal year knowing that passengers will cover just about one-sixth of the cost of a trip."